COMPANY AND A LOCAL U.S.
FURTHEST EXTEND OF THE LAW. LASER CUT TO ENSURE A PRECISION FIT TO ALL MODEL MOTORS. 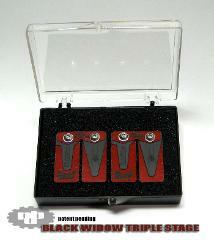 BLACK WIDOW TRIPLE STAGE REED SYSTEM. WE WILL BUY IT BACK. GUARANTEED!! !